Super Falcons manager Thomas Dennerby has named the two players that played at the highest level throughout the recently concluded 2018 Africa Women Cup of Nations in Ghana. Dennerby's decision to pick Rivers Angels gloveswoman Tochukwu Oluehi and Eskilstuna United DFF newbie Halimatu Ayinde as the two most outstanding players is not one that will surprise many. 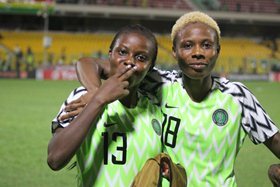 While Oluehi was named in CAF's ceremonial Team of the Tournament, the decision to omit Ayinde from the Best XI was unpopular as she was seen as the best outfield player in the squad. ''I think Halimat had a good tournament, Tochokwu had a good tournament in goal, all the defending line played well,'' Dennerby said to Bunmi Blair. The Swede added : When it comes to the World Cup or Olympics, you need one player, to have the best tournament of her life. ''If we are lucky, it could be one of the forwards, because if we have the forwards in extremely top form, it’s likely to be a successful team. The draw for the eighth edition of the Women's World Cup takes place Saturday at La Seine Musicale in Paris.